When the United States officially entered the Great War on April 6, 1917, it had been raging in Europe since the summer of 1914. Bound by its government charter to support the U.S. military, the Red Cross was championed by President Woodrow Wilson as he called upon the American people to back the organization in its support of thousands of young men heading to the battlefields of Europe. 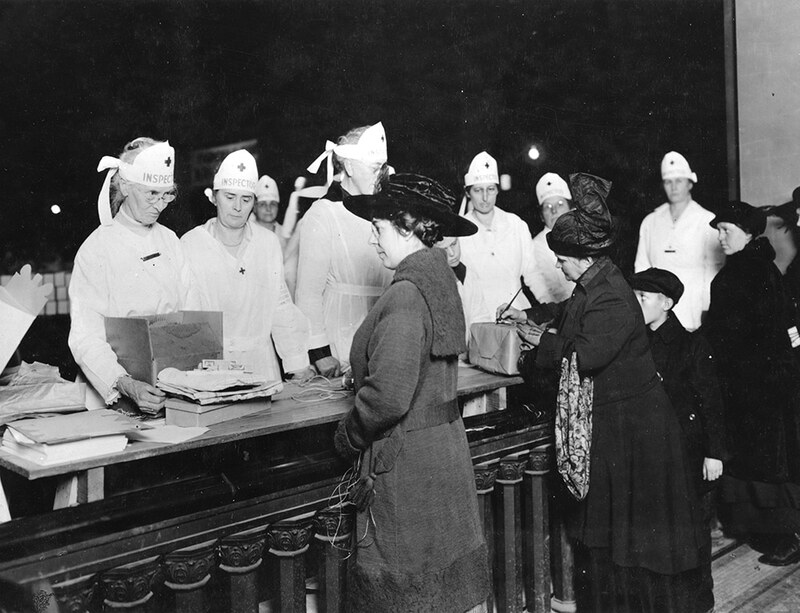 Since the start of the war, the Red Cross had been providing relief to worn-torn European countries first with doctors, nurses, and medical supplies on the SS Red Cross or Mercy Ship and later with hospital garments, surgical bandages, and refugee clothing, sent to sister Red Cross societies, and produced by women recruited through The Women’s Bureau of the Red Cross. The Production Corps started in 1916 as a result of these early relief efforts. With the U.S. entry into the war, the Production Corps services expanded and encompassed the active U.S. military. Other services that developed during the war effort included hospital service, camp, canteen, motor corps, and home service. But, the Production Corps was ultimately the most popular. It didn’t require any special training and tasks were accomplished quickly. Paris, France. Preparing American Red Cross surgical dressings at their workrooms at 60 rue St. Didier, Paris. January 1919. Paris, France. This American Red Cross reconditioning department has been in operation for some time at Rue St. Didier in Paris. A great number of women are employed here, going over and renovating articles that have been damaged in transit. Examples include cases of supplies from America that become waterlogged and unfit for use. It is here that such items are cleaned and re-sewn, such as the mattress covers being re-sewn on the left side of this photo. American Red Cross historical poster with the message: You can help – American Red Cross Beginning with America’s entry into World War I, the American Red Cross launched a massive campaign to have the home front knit wool articles for the armed forces on campaign in Europe. As soon as the call went out, thousands of Americans began knitting the required socks, sweaters, mufflers, helmets and wristlets based on detailed instruction booklets and patterns that had been approved by the armed forces. The Army and Navy regularly requested thousands of surgical dressings and what were referred to as “comfort” items for their men. Comfort items included hand-knitted socks, sweaters, soap and razors. Between 1917 and 1919, over 8 million chapter women along with many Junior Red Cross members produced over 370 million relief articles for the Allied armed forces and civilians in Europe. During the post-war period, the Production Corps continued its work as a peacetime operation. Volunteers made thousands of comfort items and surgical dressings for hospitalized service men and veterans, as well as for soldiers at remote military outposts or Navy stations. The role of the Production Corps was formalized in 1920, and it became one of the nine units in which volunteers could serve. Today, the Red Cross still has Production Rooms in service, which carry out similar services for active duty military members, veterans and disaster victims. I am looking for help finding out about my grandmother’s service during WWI. She was a Red Cross Nurse and served in France. Her name was Mary L. Hanson. She was born in August 1888, I believe that is correct and was part of Army base hospital #66. Can someone tell me how to go about finding information? I would so appreciate it! Hi Sarah, we have an update on your grandmother! If you’d like to send us an email (socialmedia[at]redcross.org), we can provide you that information. Hi Linda, Thank you for sharing! We’re glad that you had a great experience with us. While going thru several boxes of vintage items passed to us, We found a Red Cross nurse uniform. It has a crossover sash. The head piece is not a hat, but wraps around ones head. Has the little white belt with it as well. I would love to know the date/era this piece of history was worn. I can send pictures if you need them. Hi Lisa, we’d love to help! Please send pictures when you can. Thanks! On the hundredth anniversary of the arrival of the 369th Infantry “Hellfighters” Band in France, I am seeking the address of the American Red Cross Hospital Numbers Five and Nine in Paris during WWI. There are photographs on the Internet of James Reese Europe leading his band in concerts there, but the addresses of the hospitals are not given. Is a volunteer historian available to provide this information? Hi Tom, American Red Cross Military Hospital No.5 was located at Auteuil, Paris, France. This was the tent wards hospital on the Champs des Course, a race track. Harriet L. Leete was the chief nurse. It started with 300 beds but quickly became a 2500 bed facility and treated over 11,000 patients. American Red Cross Military Hospital No.9 was located at 32 Boulevard des Batignolles. This hospital admitted patients with skin diseases.There were 120 beds with a Turkish bath for special treatments. We hope this is helpful! Hi! My name is Abby! I’m doing a school project on how the American Red Cross helped in WW1! All this information has been very helpful and interesting, but I’m also doing part of my research on Walt Disney, as I am a huge Disney fan. I have read several articles on how he helped out, but I was wondering if you could tell me a little more abput what he did in the Red Cross and maybe some more details like what base hospital he worked for. I understand he was an ambulance driver, but I wonder if he did anything else? I would love a response back! Hi Abby, you can find more information about Walt Disney and his involvement with the Red Cross here: https://redcrosschat.org/2015/09/17/archives-walt-disney-world-war-driver/. Thanks! Cant figure out how to send my pics. Hello, you can send your pictures to SocialMedia@redcross.org. Thanks! Thank you for your response of January 26, 2018 to my inquiry of January 24. This information is helpful. The building at 32 Boulevard des Batignolles no longer exists — there is a gap in the street where it used to stand. Do you happen to have a photograph of the building taken from the street at the time of the existence of the military hospital there? Hi Tom, We weren’t able to find photos of the building for ARC Military Hospital #9. However, there are a few of ARC Military Hospital #3 in the Library of Congress Red Cross collection. Hope this is helpful. I am looking for help trying to find out more about my great grandmother’s volunteer service in the Red Cross during World War 1. Her name was Elsie H. Wedster (Married Last name: Lang). She was born March 29, 1900. I am not sure about where she would have served/volunteered. I happened across a picture of her and noticed it was a red cross uniform. Any help would be appreciated! Hi Samantha, can you please email us the photos at socialmedia [at] redcross [dot] org? We think that we’ll probably be able to identify the uniform. Thank you! Hi, I am transcribing the handwritten war journal of my husband’s great aunt, Clara Read Justice, who served in the American Red Cross at several locations in France during World War 1. She left Erie, Pennsylvania alone in 1917 & traveled to France on a steamer out of New York City. Any information you have on her would be greatly appreciated. Hi Dr. Davis, please email redcrosshistoryatredcrossdotorg for assistance. Thank you! I have recently been researching my family tree for a project I am doing, and was told by my mother that my great-grandmother was a volunteer for Red Cross during World War 1. I do not have any information on what she volunteered to do, however, I do know her name is Marjorie A. Lancefield. Any information you may have would be greatly appreciated. Thanks! Hi Sophia, please email redcrosshistoryatredcrossdotorg for assistance. Thank you! My grandmother was, I believe, in the Indianapolis Red Cross Home Service after World War I (1919). How would I verify this? Hi Roger, please send an email to redcrosshistoryatredcrossdotorg and they’ll be able to help you with your request. I am looking for information about a young man, William J. McConnell, who is listed by our university, Middle TN State University, as the author of our first alma mater and who died while serving in the Red Cross in 1918, possibly of pneumonia. Who do I contact for any archival record of his Red Cross activities and death? Hi Derek, please contact redcrosshistoryatredcrossdotorg.Thank you! Can you give me some direction on how I could obtain a employee service record copy of my grandfather during World War II ? Hi Debby, please email redcrosshistoryatredcrossdotorg for any information they may have. Thank you! Hi, I am looking for any information you might have about my grandmother who served with the Red Cross in France during World War I. Her name was Edna Estelle McCaughan, born September 18, 1888 in Onslow, Pontiac, Quebec, Canada. She was a nurse who served in the field hospitals in France, and she did not return home until 1919. Any information you might have about her or where she was stationed or what she might have done while there would be greatly appreciated–trying to make sure her story is not forgotten. Thank you. Hi Karyn, please contact redcrosshistoryatredcrossdotorg. Thank you! I am trying to determine if my Grandfather was in a Red Cross Hospital in Paris in WW1. He returned to the US Sept 19, 1919, nearly a full year after the war, the only soldier from his unit to return on the USS George Washington that trip. My Dad and his siblings do know that he was gassed badly. His return unit is listed as HQ Dist, Paris. That is not the unit he went over to France with, nor one of the units to which he was attached. I presume that was a catch all unit for soldiers either hospitalized or doing some official HQ duties after the war. He was in the 80th Division 305th Ammunition Train, and was temporarily assigned to Battery F, near Verdun at the end of the war, a few months before Armistice Day. His military records were lost in the fire in St. Louis in 1973, so I am hoping to find some ARC/ICRC records. Any help would be much appreciated. Thank you. Hi Gregory, please email redcrosshistoryatredcrossdotorg for assistance. Thank you! I am very happy to have come upon your blog. My great-aunt, Maud Olive Turcan, was an overseas Red Cross volunteer. She was born August 18, 1888 in Plaquemines Parish, Louisiana. When she applied for a passport as was required for overseas duty, she resided at 3400 St. Claude Ave., New Orleans, Louisiana with her widowed mother. She was a secretary; and fluent in French. Recently, I found US Army Transport Service records regarding her return, and that of other Red Cross volunteers, who sailed aboard the USS Leviathan (Brest, France July 30, 1919 to Hoboken, New Jersey August 6, 1919). The ship’s records included the name and address of the nearest relative of each volunteer. I would appreciate it very much if you could provide information regarding Maude Olive Turcan’s duties overseas. Family lore says she was a wireless operator. Thank you for your time and expertise in making our long gone loved ones recognized. Hi Nanette, please email redcrosshistoryatredcrossdotorg and they may be able to help. Thanks!